(1882–1956) movie actor; born in Lugos, Hungary. He studied at the Academy of Performing Arts in Budapest and played on the Hungarian stage (from 1901) and in Hungarian movies (sometimes under the name of Arisztid Olt) (from 1917). After making several movies in Germany, he came to the U.S.A. in 1921 and began playing character parts on stage and in films. His biggest success came in a stage play, Dracula (1927), which he repeated in the 1931 movie, but this typecast him as a villain and doomed him to playing in a series of low-budget horror films that finally turned him into a parody of himself. Reduced to promoting himself by such gimmicks as giving interviews while lying in a coffin, and constantly with money or marital problems, he became a drug addict and had himself committed to the California State Hospital in 1955. He returned to make three bad movies, including Plan 9 from Outer Space (1956), and when he died he was buried in his Dracula cape. 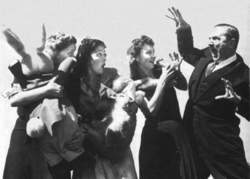 Bela Legosi menaces three young women. Bela Legosi in full Dracula garb in one of his many vampire films. A publicity shot of Bela Lugosi in character as Dracula. Bela Lugosi, the actor most identified with the image of Dracula and the vampire in the public mind, was born Bela Blasko on October 20, 1882, in Lugos, Hungary. At the time of his birth, Lugos was part of the Austro-Hungarian empire and was located some 50 miles from Transylvania. Lugosi attended school locally. Lugosi was still quite young when a traveling theater company came to Lugos and he gave up ideas of entering a profession for a life on the stage. He began to write and stage amateur productions and in 1893 left school for good. He also left home looking for an acting job; not finding any, he held various jobs as a laborer in the mines, a factory, and on the railroad. When he had the opportunity to act, his first experiences were negative. His lack of education made him appear stupid. He began a self-education program and read voraciously. His first formal stage role was as Count Konigsegg in Ocskay Brigaderos (Brigadier General Ocskay) in 1902. The following year he played Gecko, Svengali’s servant, in Trilby, his first part in a horror production. During this time he tried out a number of stage names, but finally settled on Lugosi, meaning “one from Lugos.” In 1910 he starred in Romeo and Juliet, for which he received good reviews, and went on to become a featured actor on the Hungarian stage. In 1911 he moved to Budapest to work at the Hungarian Royal Theatre and two years later joined the National Theatre of Budapest; although his salary increased, the young actor he was not given any starring roles. Lugosi’s acting career was interrupted by World War I. He returned to the theater in 1917. That same year he risked his career by taking a job with the Star Film Company and appeared in his first film, The Leopard. For the film he adopted a new stage name, Arisztid Olt. His second role was in Az Elet Kiralya, based on The Picture of Dorian Gray. He starred in a variety of films until the chaos following the end of the war forced him to leave Hungary. He settled in Germany where he appeared in several movies, including Sklaven Fremdes Willens (Slave of a Foreign Will) and Der Januskopf (based on Dr. Jekyll and Mr. Hyde). There was a tendency to cast Lugosi in the role of the villain, although his last role was that of a romantic lead in Der Tanz auf dem Vulkan. Banned from Hungary because of his political views, in 1920 he decided to immigrate to the United States. He barely escaped death when his identity was discovered by some Hungarian crew members of the ship on which he traversed the Atlantic. Although an illegal alien, he was granted political asylum and allowed to work. He organized a Hungarian repertory company, which played to the Hungarian-American community. He got a break in 1922 when he was offered a part in The Red Poppy—if he could learn the part. Unable to speak English, he nevertheless memorized the part and opened to his first English-speaking audience in December 1922 at the Greenwich Village Theatre. Lugosi received far better reviews than the play, which ran for only six weeks on Broadway before closing. The Red Poppy led to Lugosi’s first Hollywood movie part as the villain in The Silent Command (1923), an action spy movie. Unable to obtain further roles in Hollywood, in spite of positive reviews, Lugosi returned to New York and made several movies. He also appeared in several plays and made it back to Broadway briefly in Arabesque. The events that were to change his career and life forever can be traced to 1927. That year, the Hamilton Deane version of the play Dracula opened in London. Producer Horace Liveright perceived some possibilities for the play in the United States and negotiated the purchase of the American rights. He also had John L. Balderston do a thorough rewrite of the script. Director John D. Williams, familiar with Lugosi’s work in other plays, cast him in the title role. He fit the part Balderston had created as if it were made for him. His face, especially his eyes, his hand movements, and his Hungarian accent contributed greatly to the success of the play, which opened October 2, 1927, at the Fulton Theater. It played for forty weeks on Broadway, after which several companies took it on the road. Lugosi continued his part with the West Coast production of Dracula. Back in southern California, he picked up several small movie parts. In 1929, an eventful year, he made his talkie debut in Prisoners and he worked with director Tod Browning on The Thirteenth Chair. In 1930 Universal Pictures purchased the motion picture rights to Dracula. The company used Lugosi to negotiate the agreement with Bram Stoker‘s widow, and he was somewhat insulted when not automatically given the part. Rather, Lugosi was among five men considered for the role. Browning wanted Lon Chaney, but he died soon after Universal finished its negotiations with Florence Stoker. Lugosi was finally signed for $500 a week. His hardest job was to adapt the part he had played hundreds of time on the stage to the film medium. Dracula opened on February 14, 1931, and became an immediate, though somewhat unexpected, hit. The film would influence all vampire films that came after it, and Lugosi’s Dracula would be the standard against which all later vampires were judged. 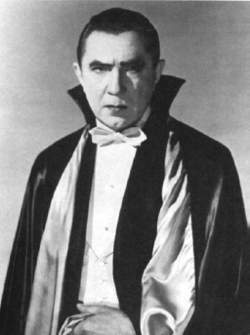 Lugosi became a star, with ninety-seven percent of his fan mail coming from women. He responded by suggesting that generations of subjection had given women a masochistic interest, an enjoyment of suffering experienced vicariously on the screen. Lugosi moved from Dracula to portray an Eastern mystic in a Charlie Chan movie, The Black Camel, and then began shooting for Frankenstein. The monster proved to be a part not made for him, so he was replaced by Boris Karloff and instead starred in Murders in the Rue Morgue, where he did well as a mad scientist. He drifted from Universal in 1932 to make White Zombies, in which he played a sorcerer, and returned to the stage in Los Angeles in a horror play, Murdered Alive. By this time, he had already been hit by the actor’s nemesis—typecasting. Studios continually offered him parts to bring terror to the audience. In 1933, Lugosi returned to New York for a brief (and last) appearance on Broadway as the villain in Murder of the Vanities. He went from Broadway to a vaudeville touring company in which he played Dracula. He periodically returned to the part in summer stock whenever his film work was light. In 1934 he made one of his better movies when Universal teamed him with Boris Karloff in The Black Cat. At the end of the year both Lugosi and Browning moved over to MGM to team up again in Mark of the Vampire. Lugosi played Count Mora in the remake of Browning’s silent film, London After Mid-night. During the rest of the decade into the early 1940s, Lugosi played in a variety of horror movies and appeared as the villain in non-horror flicks, mostly mysteries. Of these, his team-up with Boris Karloff and Basil Rathbone in Son of Frankenstein (1939) is possibly the most memorable. Publicity for The Devil Bat (1941), a routine mystery, made use of Lugosi’s identification with the vampire in its advertising. Through the early 1940s Lugosi made as many as five movies a year, overwhelmingly in villain or monster roles. He played a Dracula-like role in the comedy Spooks Run Wild (1941) and finally portrayed Frankenstein in Frankenstein Versus the Wolfman (1943). He played his first genuine vampire role since Dracula in Columbia Pictures’ Return of the Vampire (1944). Lugosi was cast as Armand Tesla, a vampire hardly distinguishable from Dracula, and, as might be expected, Universal filed suit against Columbia for infringement upon its rights. In 1948 Lugosi returned to Universal for his next vampire role. The horror theme having largely run its course, as many at Universal thought, the idea emerged to get the major monsters together with the studio’s comic stars, Bud Abbott and Lou Costello, for a monster spoof. Lugosi re-created his Dracula role for Abbott and Costello Meet Frankenstein. He played the part with as much dignity as possible and must have enjoyed it somewhat, as he did it a second time for Abbott and Costello’s television show in 1950. The downturn in horror movies left Lugosi out of a job. 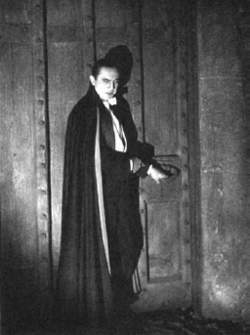 He did some television and in 1950 began to make personal appearances at movie theaters showing his old horror films. In 1951 he traveled to England to do a new production of Dracula, but the play flopped and he found himself without enough money to get back to the States. A friend arranged for him to do his next movie, Old Mother Riley Meets the Vampire (a.k.a. My Son the Vampire), released in 1952. (Mother Riley was a character in a series of British comedies.) Lugosi’s return to America was less than spectacular. His ability to get parts was very limited, and a downward slide landed him in a drug rehabilitation program in 1955. Lugosi made a few more films and then in 1956 was hired by director Edward Wood, Jr., to play a vampire for his quickie movie, Plan 9 from Outer Space. He and Vampira were to play a pair of vampires raised from their graves by outer space aliens. A week after shooting began, on August 16, 1956, Lugosi died. Another actor, doing scenes with the vampire cape pulled across his face, filled in for Lugosi for the rest of the film. Plan 9 has since become known as one of the worst films of all time and has a substantial cult following. Lugosi’s last years were years of loneliness and abandonment by the industry for which he had worked all his life. He did not live to see the acclaim of a new generation of fans who had an appreciation for the horror genre and understood his contribution to it. Only in the last generation, with the revival of the horror movie in general and the vampire movie in particular, has Lugosi’s impact been understood. Bojarski, Richard. The Films of Bela Lugosi. Secaucus, NJ: Citadel Press, 1980. 256 pp. Copner, Mike, and Buddy Barnett. “Bela Lugosi Then and Now!” Special issue of Videosonic Arts 1 (1990). Cremer, Robert. Lugosi: The Man Behind the Cape. Chicago: Henry Regnery Company, 1976. Lennig, Arthur. The Count: The Life and Films of Bela “Dracula” Lugosi. New York: G. P. Putnam’s Sons, 1974. Revised ed. as The Immortal Count: The Life and Films of Bela Lugosi. Lexington, KY: University Press of Kentucky, 2003. 560 pp. Magic Image Filmbooks, 1990. Pirie, David. The Vampire Cinema. London: Hamlyn, 1977. 176 pp. Rhodes, Gary D., and Richard Sheffield. Bela Lugosi-Dreams and Nightmares. Collectables Press, 2007. 352 pp. Skal, David J. Hollywood Gothic: The Tangled Web of Dracula from Novel to Stage to Screen. New York: W. W. Norton & Company, 1990. 242 pp. Svehla, Gary J., and Susan Svehla, eds. Bela Lugosi. Baltimore, MD: Midnight Marquee Press, 1995. 311 pp. As he was preparing for his great opus, "Plan 9 from Outer Space," Wood had an inspiration: he would get Bela Lugosi to appear in his film. Bela Lugosi seemed to enjoy doing this kind of work, or I don't know whether he'd have done it: I think he was a fine actor. Remember Bela Lugosi (and his Hollywood successors) promising the young beauty that she will enjoy eternal life in Dracula's harem? Maddin has not so much made a record of a stage production; rather, he has re-imagined Stoker's Dracula as it might have looked before the likes of Bela Lugosi and Francis Ford Coppola got a hold of it. Not a full-blown Bela Lugosi trip, but a tall, angular guy with a few vampirish suggestions messing up his look, a half-assed sort of Dracula in whiteface with a little stage blood. The son of late actor Bela Lugosi reaches agreement with Universal Studios Consumer Products Group for joint consumer products licensing of the actor's image as Dracula and as other characters in Universal horror films. Boris Karloff, Lon Chaney, Bela Lugosi, Vincent Price, Lee, Cushing, and a number of "serious" actors one normally wouldn't associate with horror films have done a wonderful job of panicking audiences, though not to the extent that they don't eagerly come back for more. A MATCH-UP between The Count and the Prince of Dartness ought to have Bela Lugosi refereeing, but don't expect a horror show at Lakeside tonight, writes Steve Davies. Night was falling as Bela Lugosi carefully removed his long black cape and draped it neatly over a chair for Carlos Villarias, whose turn it was to don it next. When star Bela Lugosi died two days into filming, Wood replaced him in the remaining scenes with his wife's chiropractor.